Embroidered handkerchiefs are a common find, but this easy DIY project transforms a hankie into a simple banner to display in your home. The free "Home Sweet Home" embroidery pattern is easy to stitch and after adding a few hanging loops, you'll have a new wall hanging with vintage charm! 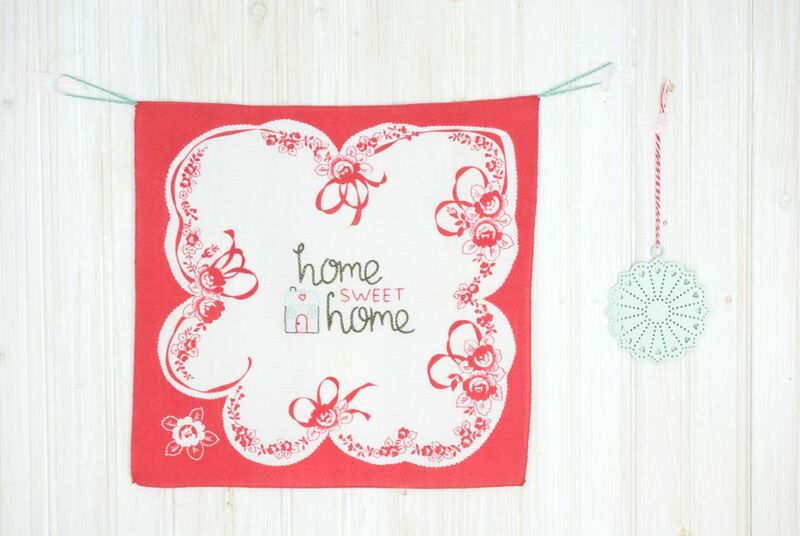 This handkerchief banner project works with any embroidery pattern you like, just as the Home Sweet Home pattern is suitable for stitching on any type of project. Vintage handkerchiefs come in a variety of sizes and designs, so select one that fits your style and let the colors in the hankie act as inspiration for your embroidery floss colors. Often these older pieces have small spots or even tiny holes. That's just part of what makes the finished piece special! Of course, a new handkerchief also works for this project. No matter what you choose to work with, grab a hoop and get started! Note: If you are using a vintage printed handkerchief or one that already has some embroidery on it, look for a design that is open in the center so you have room to embroider. Print out the Home Sweet Home pattern, resizing the design to fit well on the handkerchief you are using. Trace the pattern with a finely sharpened pencil or a water-soluble marking pen. Place the marked handkerchief in an embroidery hoop. Because hankies are typically a finer fabric, consider using a wrapped embroidery hoop. This type of hoop protects the fabric and prevents it from slipping in the hoop and losing tension. Embroider the design with two strands of embroidery floss. Use chain stitch for both instances of "home," a french knot for the doorknob, and back stitch for everything else. Avoid jumping between areas as you stitch, because the threads will show through the thin handkerchief fabric. To make the hanging loops, thread your needle with the end of the perle cotton. Bring the needle through one of the top handkerchief corners from front to back, just inside the stitched hem. Tie a knot in the end and pull the knot close to the fabric. Form a slip knot on the front, as close to the fabric as you can. Slide the crochet hook through the loop and begin forming a length of crocheted chain. Make as many chain stitches as needed for the chain to reach 5 inches long. Cut off an extra 5 inches of perle cotton and pull it through the loop to secure the end. Thread the end of the extra thread through your needle and bring it through the same handkerchief corner. Tie a knot close the fabric and trim away the excess thread. Repeat this process on the other top corner to form the second hanging loop. Display your home sweet home banner and enjoy!